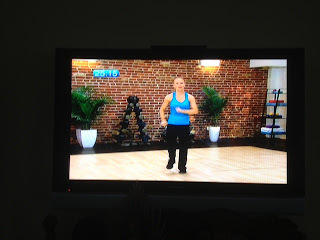 I remember a while ago I checked out On Demand workouts on my TV and was very underwhelmed. The other day we were in the midst of a spring snow storm and it was time for my workout but I didn't want to hassle with driving to the "Y" to do it with the roads as icy as they were. So I thought I would see what the TV might have as an alternative. Low and behold in the On Demand section their is a Fitness area with any number of choices for types of workouts and duration as well as intensity. It really intrigued me. First I tried an intermediate "indoor" walking workout. The trainer was peppy and good at keeping me informed. It did get my heart going and I did sweat. A good thing. I have since tried a couple of other videos for dance and cardio. I enjoyed them as well. And there are different instructors so if you don't particularly like the style of one you have choices. So for a rainy day or something new to do, check out your cable or satellite TV. You might just be surprised and enjoy something new. I did! So, as you will see in the coming weeks, I am on a new "kick". I have decided to try out the "Mediterranean Diet". All the studies show that this is the diet for the healthiest lifestyle. It is all fresh food, great flavors and spices...not much meat, lots of whole grains, olive oil instead of butter and really no sweets. What is not to like? 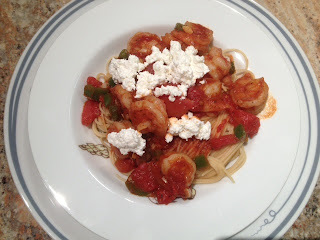 As one of our first meals I made Greek-Style Scampi. As you can see it was a very visually appealing dish. I discovered the pairing of feta with shrimp is delicious. Going all out, I used green pepper, which I normally never do becasue of its bitter after taste. It made the dish look pretty but I have got to say we all had horrible gas afterwards! I don't know what it is about the green peppers but they can have that effect! Ugh. Next time I am going for yellow peppers in this recipe! Each serving was 379 calories. To make it a meal I added a spinach salad with thinly sliced red onion and mushrooms with a light Mediterranean-style vinaigrette for 50 calories. Total calories for the dinner were 429. It was a hit and is a definite repeat. I came across a listing of foods we sometimes treat ourselves to. I like how the facts were broken down, including the various ways we could burn off what we just ate. Allows us to take responsibility and avoid the guilt. 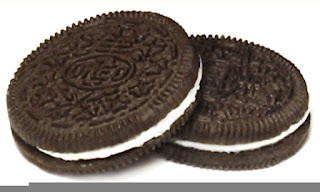 I hate looking at Oreos on my hips....now I can avoid it! For more of my Livliga recipes that are easy to use and print go to livligahome.com. "Laughter is the sun that drives winter from the human face"
No matter how hard I have tried to limit my sweets, I just can't seem to do it. They are truly additive. Research shows its true...and I am not the only sugar addict out there. I kept dancing around the issue, thinking I could somehow control the addiction, but I can't. So, I ate my last piece of chocolate cake on Sunday night. 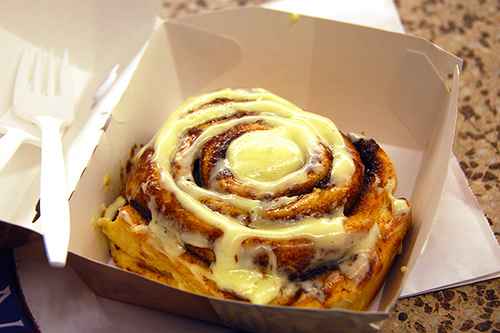 No more desserts, no more sweets. No exceptions and no time limits. Just can't do it. So even in my morning oatmeal there is no more brown sugar. Even in the morning latte there is no more sugar-free French Vanilla. No more cookies for an afternoon snack. No more adding in honey to my Greek yogurt. 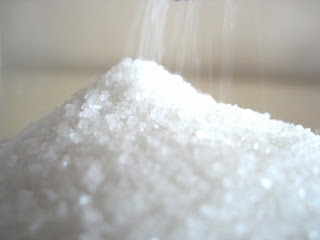 This doesn't mean I am going to become obsessed about sugar but it does mean I am going to avoid it as much as possible and be mindful, including reading the labels at the grocery store to avoid those canned goods and other pre-packaged foods I need for a recipe that have corn syrup added to them. There are alternatives these days and I plan on buying them! Two days in and I am finding this way easier than limiting my sugar. Sugary foods just trigger my need for more sugary foods. This way nothing is getting triggered. I am really liking this new commitment! I understand this won't work if I don't really change how we are doing things at home. So the cupboards are bare of junk food. The ice box is full of fresh veggies, some of them already cut and ready to munch on. And the fruit stand has a variety of fresh fruit. Yep, fruit is in. It doesn't have the same triggers as substitute sugars and refined sugars do. It also doesn't have the emotional strings attached as cakes, ice cream and cookies have for me. We have also gone to a Mediterranean diet. I am so focused on discovering fun recipes and learning more about the key ingredients of this diet, I don't need to feel bored and go grazing for "empty foods". Would love to hear from others on this same road. How is it going? 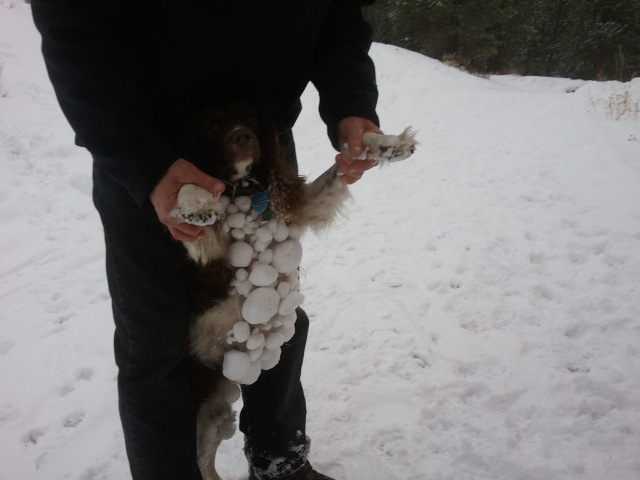 Well it may be Spring but the weather out there is turning frightful! Time to make pizza. 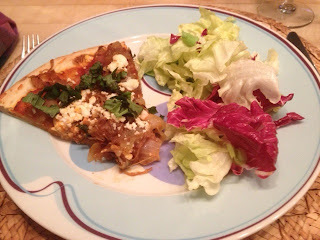 Making homemade pizza can be easy and will be way healthier for us to eat. One of my favorite easy pizzas to make is Caramelized Onion and Goat Pizza. 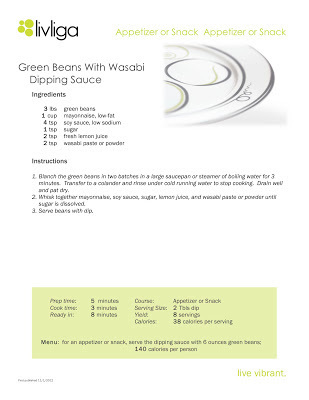 Cut into 6 servings, each serving is 285, which is what the recipe calls for. I prefer to cut the pizza in 8 slices and give each person 2 pieces for a total calorie count of 427. 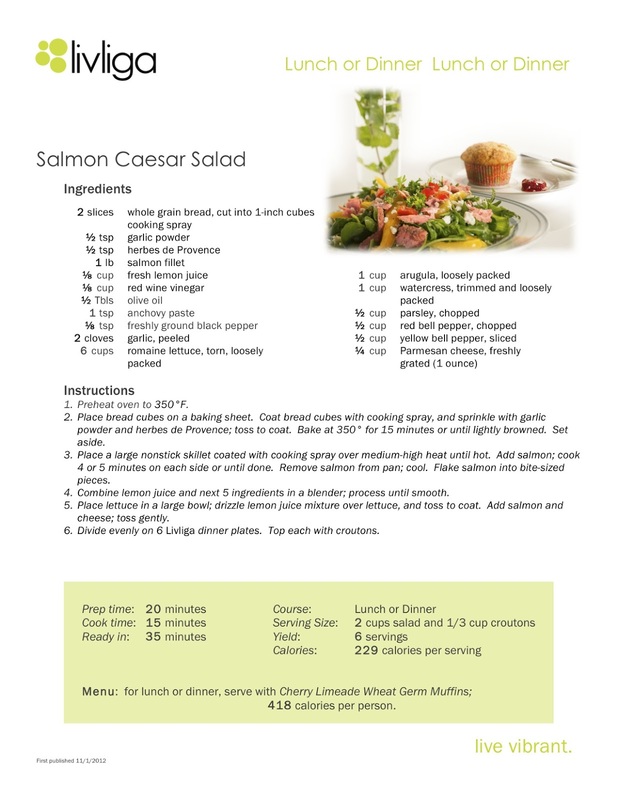 Add a tossed green salad with 2 tablespoons of lite dressing for 45 calories. Makes a meal for 472 calories. It is very satisfying and you feel like you have had enough. Everybody in the family gives this meal a thumbs up. A regular repeat. I came across a listing of foods we sometimes treat ourselves to. I like how the facts were broken down, including the various ways we could burn off what we just ate. Allows us to take responsibility and avoid the guilt. I hate looking at Cinnabons on my hips....now I can avoid it! 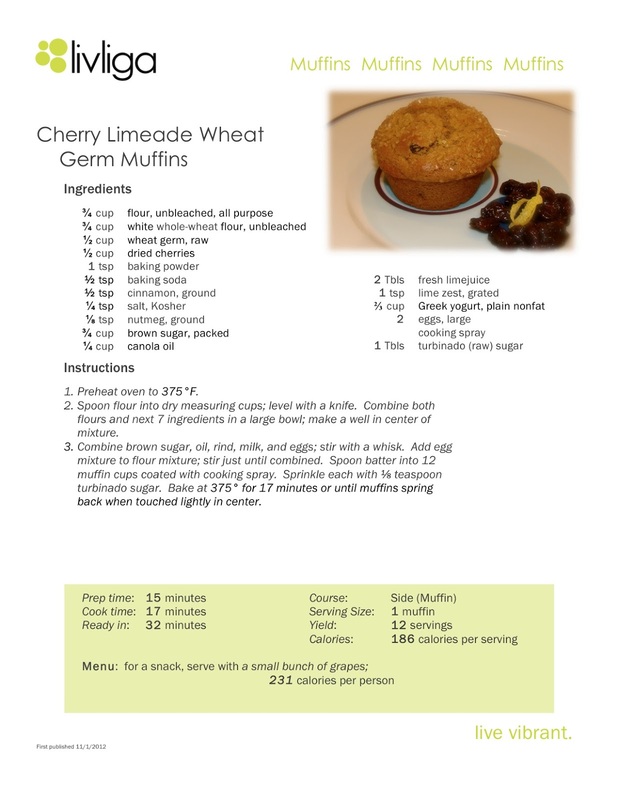 Cherry Limeade Wheat Germ Muffins--Hearty & Tasty! This muffin is packed full of good ingredients. Lime juice has been proven to fight cancer and fortify our immune system, for instance. And then there is the whole wheat flour and wheat germ which are great fiber sources. There is also Greek yogurt in them to add to the protein in this amazing muffin. And what I like most is that there is no refined sugar in this recipe. This muffin is made to be satisfying not only while you are eating it but also for a nice amount of time afterwards. Enjoy it as a snack with a cup of tea and you will be set for what comes next. It is worth all of its 231 calories per muffin. I love how changing a sequence of words by spelling or lay out makes you see the meaning differently. This quote brought a smile to my face and a warmth to my heart. Hope you will feel the same! When I started baking healthier cookies, one of the things I discovered was measuring out the dough to a right-sized portion. In a chocolate chip cookie recipe from Cooking Light, it instructed me to drop the cookie dough in 1 tablespoon measurements. At first I used my 1 tablespoon measuring spoon. 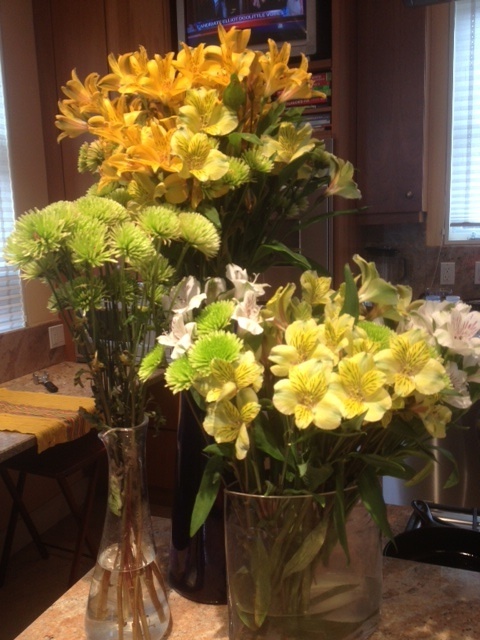 It was laborious and not very easy. I decided I needed to look for a small version of an ice cream scoop. Turns out if you go to a culinary store, like William Sonoma or Sur La Table there are actually cookie scoops in different sizes! I found my 1 tablespoon scoop and have been using it ever since. It is so easy. I can whip through a recipe in no time flat. It makes prettier cookies, too. They are much more uniform. Some how right-sized, visually appealing cookies are much more satisfying...and the calorie count is much more reasonable. 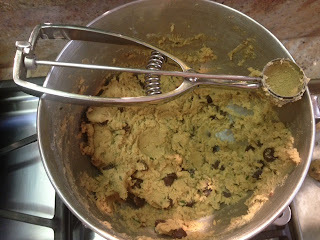 I recommend you get your own 1 tablespoon cookie scoop! Then we can swap cookie recipes. What fun! It is my pleasure to share that Livliga now has a YouTube channel! Please check out our first video and subscribe to our channel so you can be the first to see the other videos to follow. I love risotto. It is time consuming so I tend to do it on a weekend night. I find it heavenly for a Sunday night supper. It is a comfort food. It is also one of those dishes that is very versatile. You can put just about anything in it from blanched vegetables to different types of cheeses. What I also like about risotto is that it makes a great vegetarian dish. It can be the main dish for the nights you want a vegetarian meal. Recently I discovered you can also use different, healthier grains, to make a risotto. There is a great recipe for Mushroom Barley Risotto. It is creamy and hearty. Mushrooms are "beefy" so they can add substance to a dish, filling you up. You can choose your favorite mushrooms and mix them up for flavor and variety. 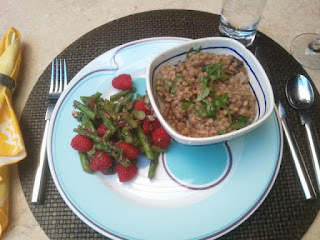 It is 321 calories for 1 1/4 cups.To make it a meal, I added an Asparagus Raspberry Medley for an additonal 67 calories. Such a healthy, hearty meal for a perfect 388 calories. A satisfying hit for the family and a definite repeat. Smelling food can trick your brain into thinking you've eaten. One study found that people who inhaled a peppermint scent every two hours ate 2,700 fewer calories per week than they normally did—that's nearly a one-pound loss! Banana, green apple, and vanilla had similar effects in other studies. And the more often you sniff these aromas, the more weight you'll lose, says Alan Hirsch, M.D., neurological director of the Smell & Taste Treatment and Research Foundation in Chicago. Stash some vanilla-scented candles in your snack drawer or cupboards. And if you tend to eat when stressed, hold your left nostril closed and sniff through the right one to activate the side of your brain where emotions are processed. 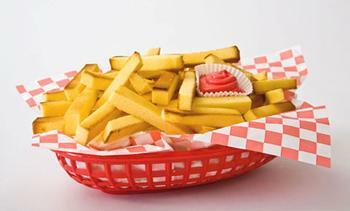 It could help reduce your anxiety and your appetite. Every once in a while I like cleaning out my refrigerator of my leftover vegetables. This salad is one I enjoy making to help me clean out my refrigerator. It uses a lot of different veggies and lettuces. Honestly, these are items you can mix and match, depending on what is in your refrigerator. One of my favorite salads is a Caesar Salad. Nothing like croutons and an anchovy dressing! The challenge is it can get fattening really quickly. I have found by baking my croutons I avoid a lot of unnecessary calories. They can still be very flavorful by adding California garlic powder, herbes de Provence and some Olive Oil cooking spray to them before baking. The trick to the delicious dressing is to emulsify it in a blender. By putting the ingredients in a blender, it makes it creamy without adding the fat. This is a cheery salad to look at and great to share with family or when you have company. And for 229 calories per serving you can choose to add a delicious muffin to complete the meal. Try a fresh baked muffin like my Cherry Limeade Wheat Germ Muffins! There is so much more fun to come for this special three day launch of Livliga. Tomorrow at the luncheon attendees will be learning more about how to use the beautifully designed dinnerware. Some at each table will be served lunch on the plates! EVERYONE will get to go home with a 4-piece, single place setting to enjoy using in their own home. And there will be a great presentation about healthy living by nationally acclaimed cookbook author Judith Fertig. Can't be more fun than that! Come join us! Reservations and ticket purchase can be made by going to websterhousekc.com. Then, if you are looking for some evening fun, we have a very special Celebration to toast the launch of Livliga-- conceived by yours truly to help make a difference in our fight against obesity and our search for a healthier lifestyle. Proceeds from the evening will go to Children's Mercy Hospital to support the hospital's nutrition outreach program for children at risk. Living a healthy lifestyle is key for our kids...all of our kids! I thought this article eye-opening and worthy of sharing. It validates the very reason Livliga was created. Livliga is the mindful choice for right-sizing our world and the portions we serve up in our homes. That correlation helps explain why obesity has been more prevalent in the U.S. than in France. The French eat high- calorie food, but their portion sizes are smaller. In supermarkets and restaurants, and in portion sizes recommended in cookbooks, Americans are given significantly bigger servings. Even at McDonald’s, where we might expect identical sizes, servings of soda and French fries have been found to be larger in Philadelphia than in Paris. Brian Wansink, a Cornell University professor of consumer behavior, helps to explain why portion sizes have such a large effect. He finds that much of our eating is mindless or automatic in that we tend to eat whatever is in front of us. If you are given a half-pound bag of M&M’s, chances are that you will eat about half as much as you will if you are given a one- pound bag. People who receive large bowls of ice cream eat a lot more than those who get small bowls. The redesigned cafeteria took a number of smart steps to make healthy choices simpler and more convenient (and to make less healthy choices less so). As a result, it helped to produce big reductions in both calories and fat consumed from candy. A striking feature of the Google initiative was that employees were grateful for the nudges. There is reason to think that many consumers would respond the same way. In a series of studies, researchers told fast-food servers to ask customers whether they wanted to “downsize” their high-calorie side dishes. A substantial number (from 14 percent to 33 percent of those served) consistently agreed to do so. Strikingly, they accepted the offer whether or not they were offered a nominal 25 cent discount. Their total calorie consumption was reduced, on average, by more than 200. The broader lesson is that obesity levels, in the U.S. and elsewhere, are hardly inevitable. They are a product of the social context in which people’s choices are made. With careful attention to the subtle social cues that lead to excessive eating, we should be able to make a real dent in a serious public health problem. This recipe is an all time favorite of this family. It is easy to make, can store well in the refrigerator for a few days, and mixes the savory and sweet taste sensation in a dip. My guests always comment on it while gnawing on their second or third green bean. They are actually a little amazed at how much they like the dip AND the blanched green beans. 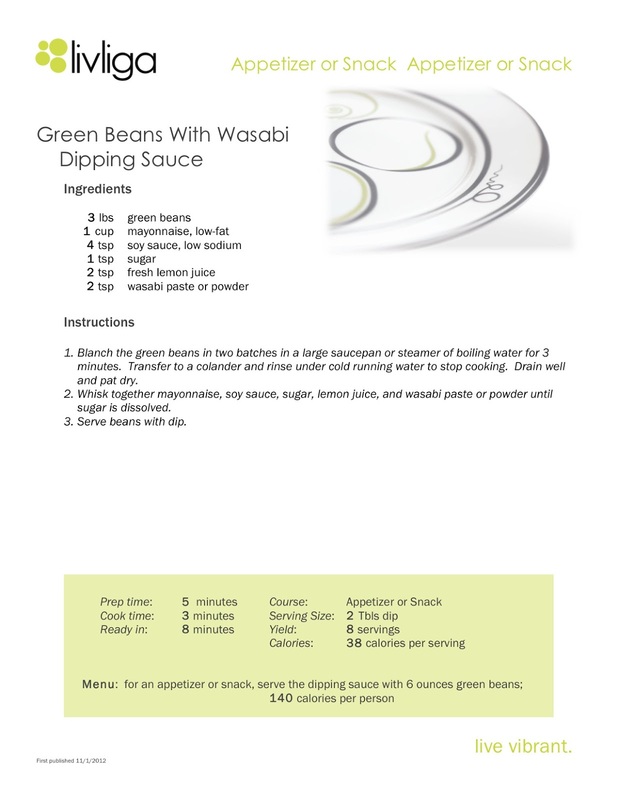 One serving, which includes 2 tablespoons of dip and 6 ounces of green beans is a mere 38 calories. When you think you are serving your loved ones and friends fresh veggies with a low cal dip and they love it, you know something right has just happened! 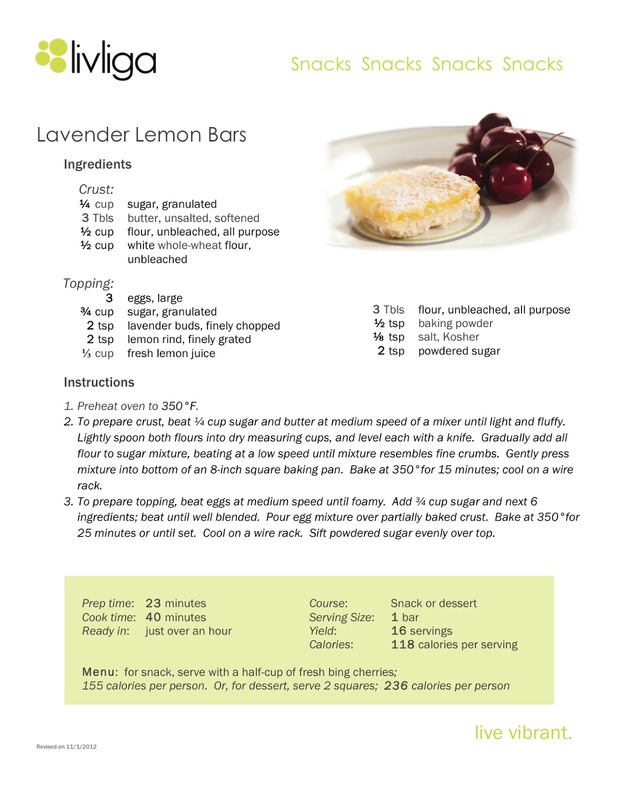 For more of my Livliga recipes that are easy to use and print out go to livligahome.com. You might have noticed some buzz about our new venture...It is amazing to think our public launch of our new company, Livliga, is this coming week in Kansas City at Webster House on March 7-9. We are so excited about the Live Vibrant Weekend. One of the events is already sold out!- "My Kid The Healthy Chef"- the other events still have room. We would love to see all our Kansas City friends at one of the events. Please go to http://www.websterhousekc.com/livliga and sign up for some fun! Can't wait to see our friends! We would also welcome making new friends as we are all on the journey to support a healthier lifestyle for ourselves, our families and our friends. Live Vibrant! There is nothing more beautiful than a bowl full of fresh fruit. 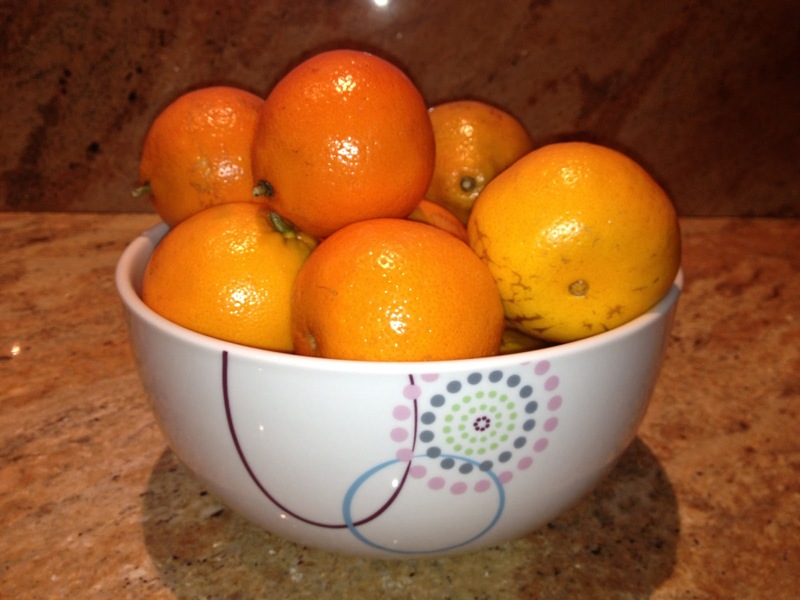 I learned a long time ago that having a bowl of fruit on the counter is a great way to avoid grazing on less nutritious foods. Those foods are stored in a cabinet. The fruit is within arms length. I have also learned to make sure the fruit is fresh. Old shriveled up fruit is unappetizing and is more likely to send someone to the cabinet to munch on the starchy stuff. To set us all up for success, I buy fresh fruit every week at the grocery store. I buy our favorites but I also buy what is in season, like these Honeybells. Special fruits make it a desired treat. That way they are more likely to get gobbled up and definitely chosen first above other food choices. The photo is of our last-of-the-season honeybells. Parting will be such sweet...and satisfying sorrow! Note: the bowl in the photo is our new Livliga Aveq bowl. It is attractive and right-sized. If you are interested and want to consider one for yourself, you can find it on our livligahome.com website. 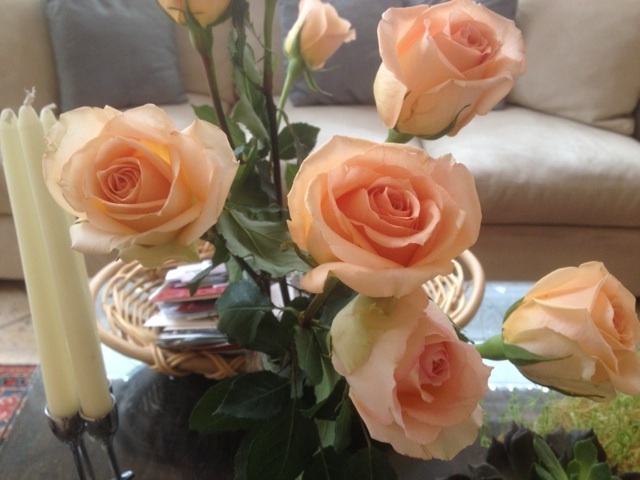 Enjoy and Live Vibrant!